Ships today if you order in the next 15 hours 57 minutes. Now you don't have to choose between coffee or a green drink to start the day or get a much-needed mid-afternoon energy boost. 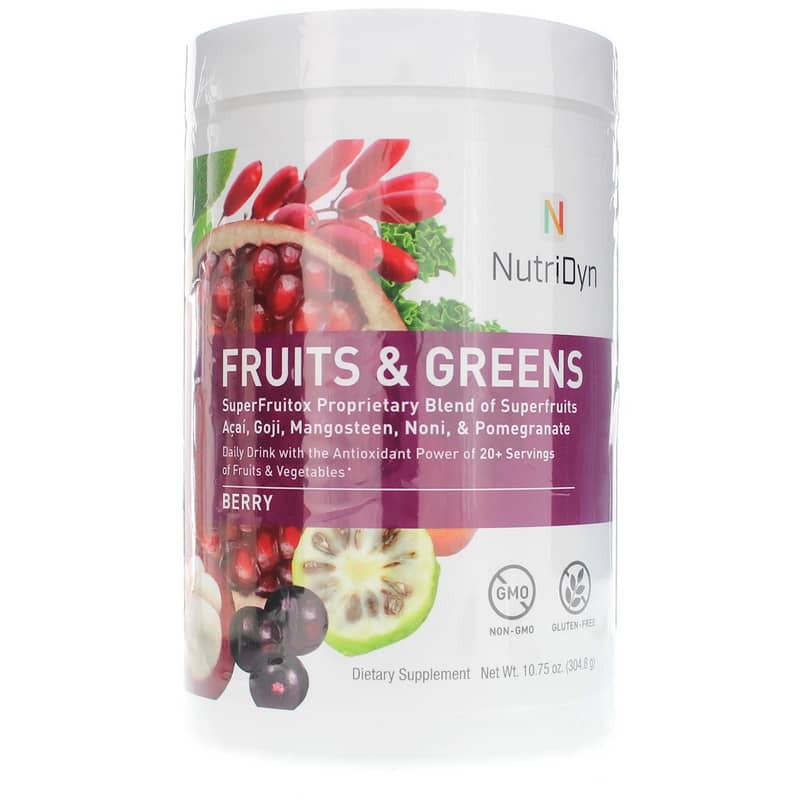 Dynamic Fruits & Greens with Superfruits from NutriDyn combines the nutrient-packed goodness of superfruits, whole-food concentrates, greens, fiber, enzymes and probiotics with real (caffeine-free) espresso flavor in an easy-to-mix powder. What makes a food super? 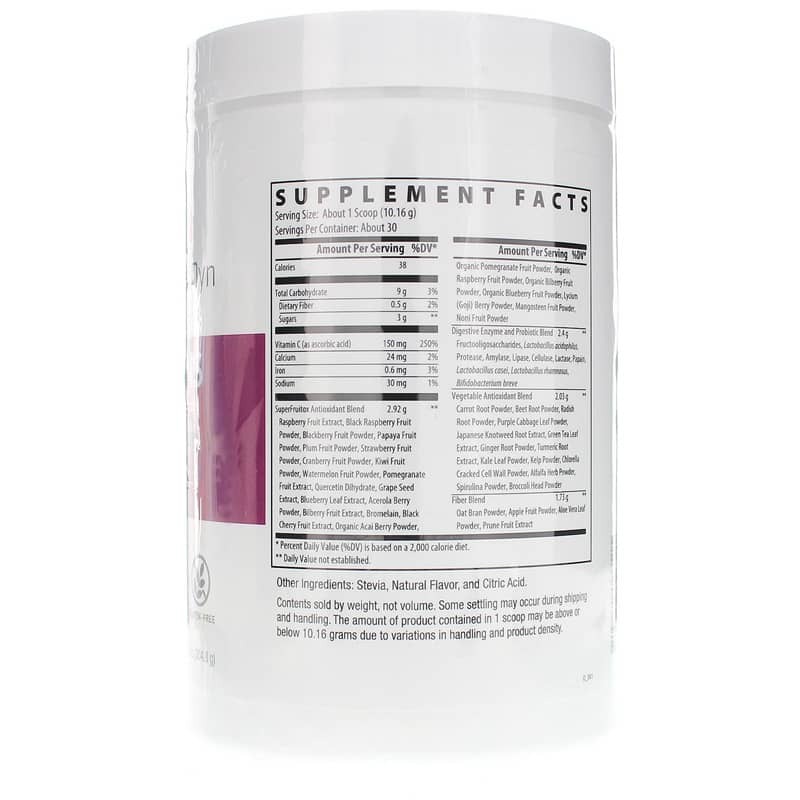 A high vitamin, mineral and antioxidant content. Antioxidants are 'free-radical scavengers' that can help counteract the effects of oxidation from the stress, chemicals and toxins we may encounter on a daily basis. Give this delicious espresso-flavored green drink mix a try for vibrant, healthy energy without the crash or jitters that coffee can bring. Just one glass makes a superfood-packed addition to your morning meal, before or after a workout, an afternoon pick-me-up at work or as a delicious alternative to sodas or other sugar-y drinks. Order yours now! Contains NO: GMOs, gluten, preservatives. Adults: Mix 1 scoop in 8 fluid ounces of chilled water daily or as directed by your healthcare practitioner. Love dynamic fruits! Product was recommended by personal trainer to ensure that I was getting proper servings of nutrition daily since eating habits shared were not sufficient to provide daily nutrional value. Since drinking dynamic fruits daily I feel better, have more energy and eat better. Strawberry & Kiwi is my favorite! I love this product!! I use it everyday in my morning shake and tastes great. It really helps me get my greens in for the day. Love the flavor! Like the holidays in a cup! Happy to find a source for my favorite flavor nutrition . I think the pink lemonade tasted better than the berry. Like eating a small meal. I like to add this to my protein smoothies for a healthy breakfast or mid day snack. I know I am getting some fruits and greens and a yummy chocolate taste. I add a scoopful to my meal replacement shake for the vegies and berries. The product is tasty and I know I'm getting in my diet all the nutrition I need for my life style. 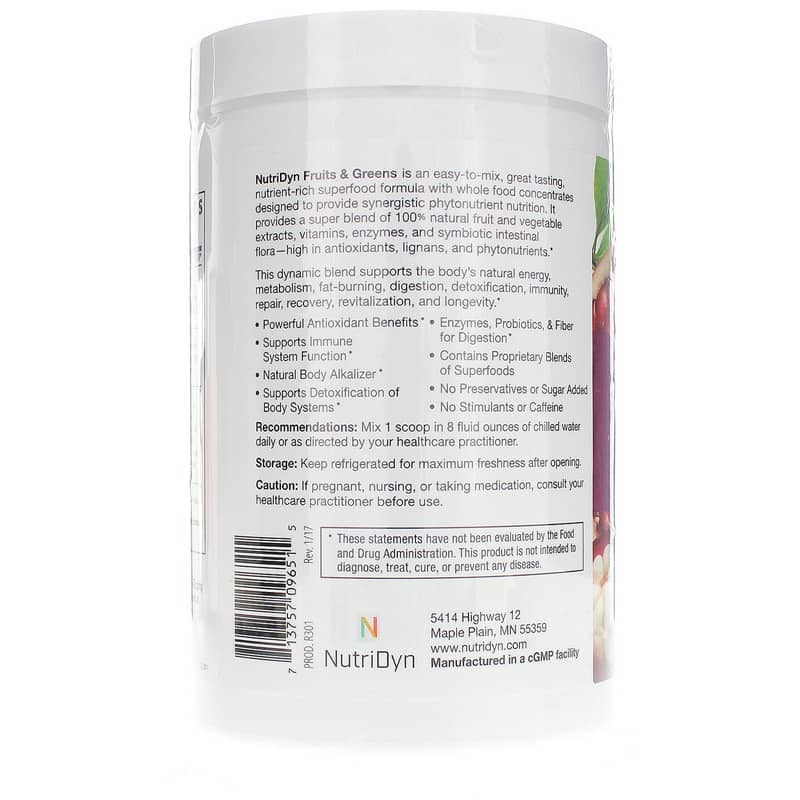 I would recommend this shake to anyone who knows they aren't getting all the nutrients in their diet. The product was just as I hoped, in good condition, and arrived quickly. I have used a nutri-bullet to blend this and chug as fast as I can, still doesn't go down well. It does a bit better with a banana but I don't want extra calories or sugars. Thumbs down. I don't even know what I paid at the chiropractor's' office. I'm going back to my previous powder. Reasonable price, quick shipping, products are great! Great product, been using it for years. Great quality. This is a great product and I really like this flavor. I enjoy the taste of this just mixed in water. I much prefer the Espresso. I have no idea what it does for me but hope that the statement is right that it is the same as 20 servings of fruit and veges. When making a protein shake with protein powder and fruits or vegetables, Fruits and Greens add an extra boost of flavor and nutrients. Strawberry Kiwi is my favorite addition to berry shakes. Espresso adds a kick of chocolate to pb and banana shakes or even ones with the addition of avocado or spinach to a berry shake. This brand is the best tasting to me, especially since my fitness club no longer carries it. Other brands just don't cut it. I can't believe I am getting my greens in such a tasty way. I like to blend my morning greens with coconut/ almond milk. I understand some have had difficulty mixing this powder. I find using a stick blender works perfectly! I like the flavor and have been using every day for about 9 months. The fruits and greens taste good. Fast and easy shipping.